Breakwater Island off the eastern end of Gabriola Island, has a little known but great dive location. Accessed by boat, this nice wall dive on Breakwater Island is on the inside of the island facing Drumbeg Provincial Park (Gabriola Island). There is a marker on shore about half way down the Island, and then just south of that watch your sounder and you will find a perfect shelf near shore to drop anchor. The anchorage is where the kelp is, which coincidentally will help you see what direction the water is moving, and how fast. There is not huge current here, but its best to dive this site on a slack just before an ebb turn. 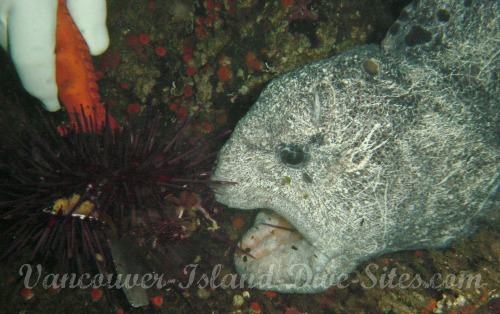 On a trip there we encountered the above hungry Wolf Eel who readily ate the sea urchin that was offered. There were also several fairly large Ling Cod that did not seem the least bit afraid of us, as well as a wide variety of Rock fish. The wall had more than a few caves cut into it, and the bottom (which was around 80ft (24m) in depth), is strewn with rocks and boulders. It makes excellent habitat for the Rock fish and Wolf Eels! There were also quite a few Rock Scallops as well as many other small invertebrates and fish to check out at this great dive site. Remember your camera if you have one! While in the area there are a few other really good dive sites only minutes away. Make no mistakes, the current can and frequently does run over 6 knots in Gabriola Passage, so plan your dive, or dives accordingly. By the way, you can also dive Gabriola Passage from shore out of Drumbeg Provincial Park on Gabriola Island. Follow the above link for a description of how! Thanks for visiting, and safe diving!